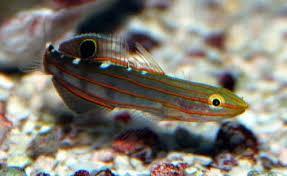 Also reffered to as the Rainford's Goby and a wonderful marine fish that is a great addition to any reef tank , with a green / blue body and striking orange horizontal stripe. A very peaceful species that will not grow any bigger than around 7 cm therefore making it suited to any size aquarium of over 10 Gallon. Feeding is straightforward and amost all prepared foods will be accpted readily.